The chaotic world and demanding lifestyle tend to take a toll on mind and body. Come weekend, instead of getting jump on the couch and parking yourself in front of the television, recharge your tired mind and body with naturalistic experiences. Epitomizing a perfect mélange of plush amenities and the best of nature, resorts in and around Jaipur serve as the perfect retreat from the mundane city life and enjoy a relaxing and tranquil weekend with your friends and family. Believe us, nothing else can give you the peace of mind the way the serenity of these resorts would. Here, we are listing down some of the finest resorts of Jaipur that promise to transport you to another enchanting world filled with joyful moments, best in-class services and luxurious hospitality in a beautiful natural setting. Tucked away in the lavish environs of the Aravali Hills on Jaipur-Delhi Highway, Kukas, Rajasthali Resort is truly one of the fascinating resorts in Jaipur to witness the marvels of nature, experience pleasing moment and make yourself feel new. 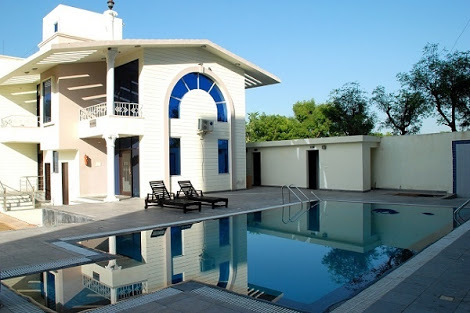 This beguiling retreat, at a merely 20 min distance from the Jaipur on the Jaipur-Agra highway, the Cambay resort promises to bring a bit of fun in your weekend and offer you a significant serenity from the routine hustle clamor with its recreational facilities The highlight of this resort is its 9 hole golf course. 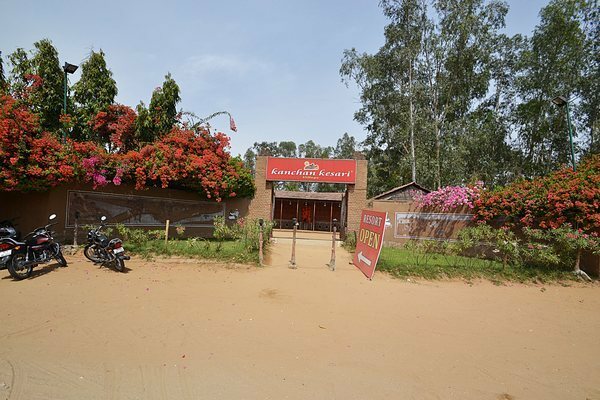 Set amidst woods and plush lawn on Agra Road, WoodsVilla is a beautiful resort to experience the nature at its best.The resort has a mini zoo that has various species of birds and animals. So if you are planning a trip with kids this will surely make them happy too. To savor a variety of Indian & European dishes, its in-house restaurant is just perfect. Candle light dining option by the pool is also available. Located in picturesque foothills in Kukas near Jaipur city, the Lohagarh Fort resort is an ideal getaway for nature lovers, bird-watchers, honeymoon couples and families on weekend. The accommodation is given a distinct styling and rustic appeal. Complementing to it is the breathtaking view of the hills to give a close-to-nature feel. A beautiful boutique resort with a spirit of contemporary Rajasthan! Located on Agra road and designed along curved streets at different heights, the resort offers ensures a spectacular view of the Aravallis Mountains from every room without missing on the comfort factor. Amidst the exotic wilderness, hills and streams on NH-8, the Tree House resort creates a perfect ambiance required for a hassle-free and undisturbed weekend. Equipped with all contemporary and recreational facilities like golf course, billiard room, spa service and swimming pool, the resort is a perfect weekend getaway for a unique experience. 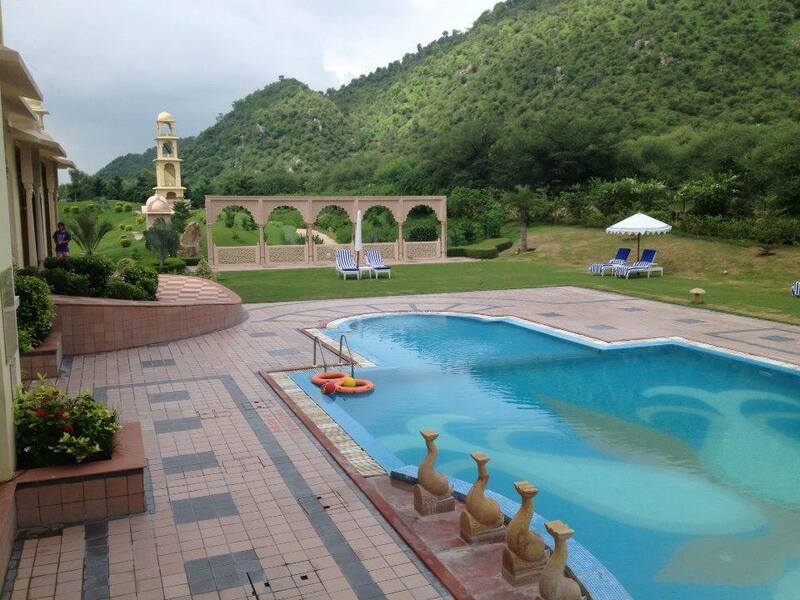 This village resort on Jaipur-Ajmer road is a nice relaxing oasis to spend a leisurely weekend amidst breathtaking surroundings. Its pleasing ambiance combined with warm hospitality is sure to win your heart. 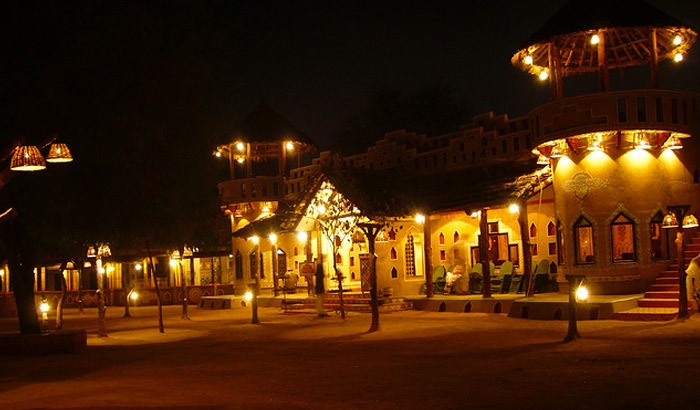 Its “Jeeman” restaurant is perhaps the best spot to savor local Rajasthani delicacies in the conventional manner, where food is served with wonderful painting “Teej ki Savari” in the background. 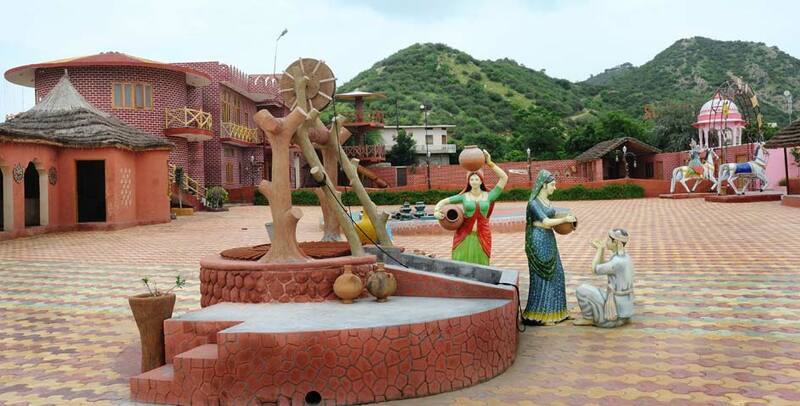 Chokhi Dhani on Tonk Road, is another great place to spend a fun-filled weekend with a bevy of traditional entertainment and lip-smacking Rajasthani Thali. Depicting the authentic culture of a Rajasthan village through its traditional mud and thatched roof lodging and complementing it with the modern amenities, the resort is a must-visit to experience the best of both worlds. 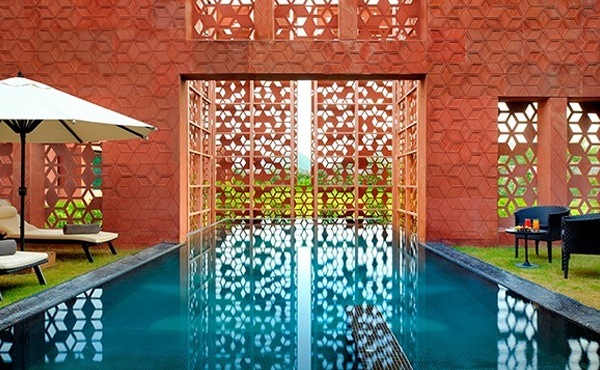 Located on Jaipur Delhi highway, La Premier Spa & Resort will engulf your weekend in the scenes of calmness. 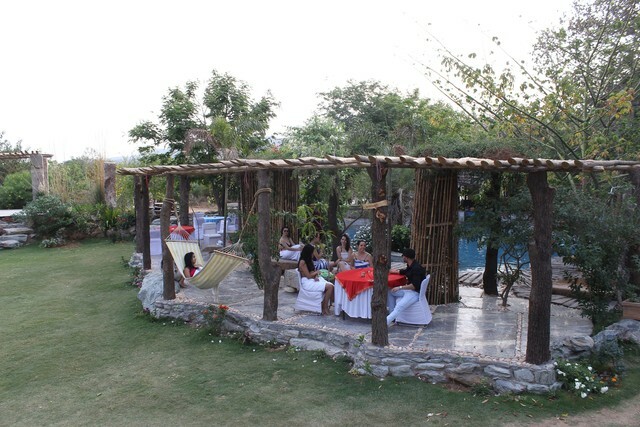 One can enjoy an enchanting view of small hilly region that envelops this resort completely. 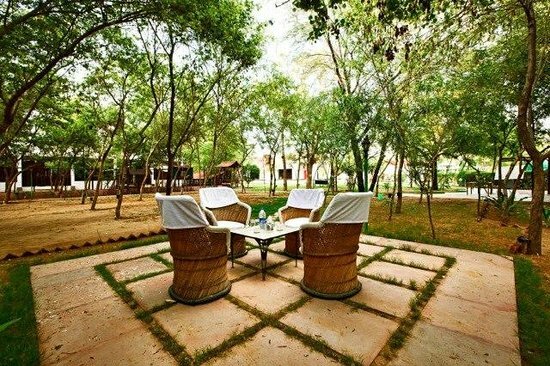 On Jaipur Delhi Highway, this peaceful oasis, where times moves in a relaxing and slow place makes for an ideal weekend getaway to soak up the serenity and spend lighter moments in its abounding greenery. 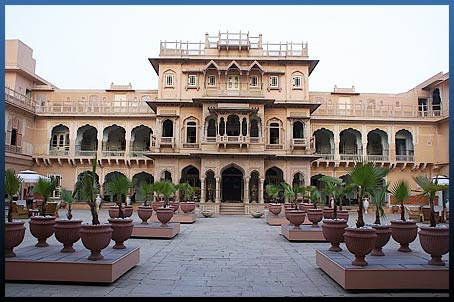 Nestled at 33 kms from Jaipur at Chomu, this 300 year old fortified palace hotel promises to bring the gracious lifestyle of the princes of Rajasthan and rich heritage of India to life. Now a days it is a favourite amongst movie producers in Bollywood and a popular hotel for Film shootings. Remember Bol Bachhan & Bhool Bhuliya. A vacation at these resorts would unquestionably prove a booster to your sluggish soul. Thus leave all your worries behind and reel-in your weekend what these resorts have to offer.